Although I hardly ever crave meat itself, I do crave the texture of certain meat dishes like bolognese. 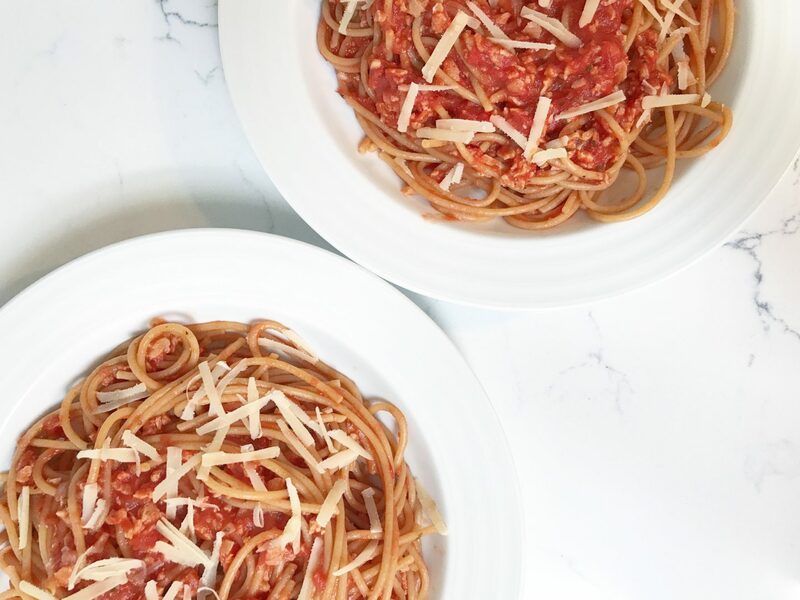 There’s something about tomato sauce with a bite to it, and when it’s served over al dente pasta, there’s nothing better. Luckily, this is one of the easiest meat dishes to make meatless. There’s even a couple of ways to do it. Veggies/Legumes – Adding lentils to your tomato sauce is an easy way to achieve a bolognese texture and give it a boost of plant protein. I also like Mark Bittman’s recipe for meatless bolognese, which you can find in the VB6 Cookbook. It features a mixture of beans, carrots, zucchini, and pepper. Crumbles – Vegan meat products such as Gardein Beefless Ground, Lightlife Smart Ground, or Beyond Meat Beefy Crumbles resemble browned ground beef and are easy to add to fresh or jarred tomato sauce in the last couple of minutes of cooking. TVP (Textured Vegetable Protein) – Made from defatted soy flour that has been cooked under pressure and then dried, this meat alternative is a complete source of protein. You have to rehydrate it before cooking and it takes on the flavor of what you cook it with. I keep a bag of Bob’s Red Mill TVP in the pantry at all times so that I can always make a quick bolognese. While I enjoy all of these variations on vegan bolognese, I’m most partial to the TVP version lately. It’s super budget-friendly, easy to cook, and satisfies the craving for a hearty “meat” sauce. Here’s how I make it. Vegan pantry staple TVP makes for a great meat substitute in this hearty (but totally quick and easy) meatless bolognese sauce. Sauté onions in olive oil until they are translucent. Add TVP and cook for a couple of minutes until slightly browned. Add tomato puree and stir well. Season with salt, pepper, dried basil. Bring sauce to a simmer, adding a little water if the mixture is too thick to properly do so. Cook pasta al dente according to the directions on the package. When you are draining the pasta, reserve 1 cup of the water you have cooked it in. Transfer the al dente pasta to your simmering sauce and combine. Add in some of the starchy pasta water as needed to achieve the right consistency and help the sauce stick. Serve sprinkled with cheese of your choice (I like freshly grated Violife vegan parm).